At first I thought that this was yet another Nokia Morph wannabe handset, but as soon as I realized that the actual phone is a hologram I was like “what the?”. Check out the picture below to figure out the mystery for yourself. As you can see, we need to attach a couple of small projectors to our fingers in order to “create” the screen of the device. 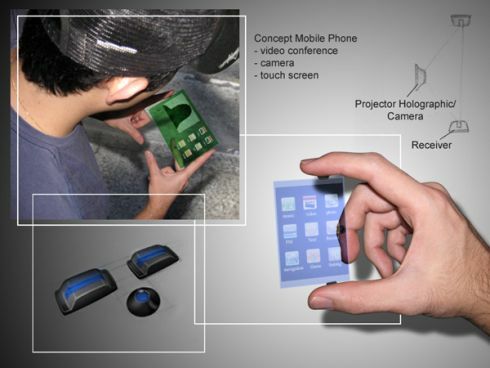 This concept phone also comes with a camera, but don’t ask me where that is, because I haven’t figured it out yet. It must be on one of the user’s fingers, as is the receiver, but what about that touchscreen? Do the small accessories sense when you touch the screen? The problem with this device is that you’ll have limited finger mobility, but the idea is great and surely original. Congrats Ronnie Ishii for such a brave and crazy (in a good way) design!